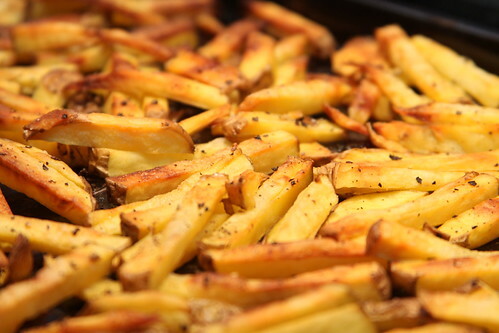 The Farr Place: French fries are unhealthy? So What! A couple of guys who wrote some books on what to eat and what not to eat (that's right, I said guys), these two guys recently did some research on the three worst French fries you can get at chain restaurants, basing their list on things like fat content, calories and sodium. According to these two guys (at least they SAY they're guys), Arby's serves the worst Curly Fries money can buy. They'll cost you 640 calories, have 34 grams of fat, and 1,460 mg of sodium -- and if there was an Arby's nearby, I think I'd go rustle me up an order. Next are the wedge fries -- my personal favorite. They say (they being those two quasi-guy writers), they say the worst wedge fries in America are the Bacon Cheddar Wedges from Jack in the Box. Well, I say I doubt very seriously these guys have ever tasted the Bacon Cheddar Wedges from Jack in the Box. I bet they have some kind of machine they plug right into the spuds and it does all the counting for them -- so as not to taint their healthy hearts with something so sinfully "bad." These two girly-men (thanks Mr. Schwarzenegger) say the Worst Fries in America are the Texas Cheese Fries w/Jalapeno Ranch from Chili's. Did you see that? They used "worst" and TEXAS in the same sentence, and I KNOW that's a no-no. Gentlemen -- if that's what you be -- I appreciate the fact that you've done some mighty fine French Fried research on America's favorite side order, but we really could care less about all those non-healthy numbers. We don't want salad, we could care less about fiber, we don't give a flip about fat, and if an order of Texas Cheese Fries w/Jalapeno Ranch has enough sodium in it to kill a horse -- then don't feed it to a horse. Luckily, we have a Chili's in town. Can you guess what I'm going to order next time I'm there? Of course you can!